Aussie Scrap Source are continuing on with their calendar sketch challenges. I am up this week with "March". It worked perfect for me being Cooper's birthday month. So I grabbed a picture from his 5th birthday this year plus the Echo Park Everyday Eclectic collection and this is what I came up with. I just love the sketch Suz created from my layout.......super funky right? And here is the April Sketch. Check out the blog for more inspiration ! That's it for today, having a little getaway this weekend so see you next week with some new piccies hopefully :) Thanks for dropping by ! love love your layout....love the sketches.....march is my 18mth olds bday mth too.......are these challenges that we can do?? 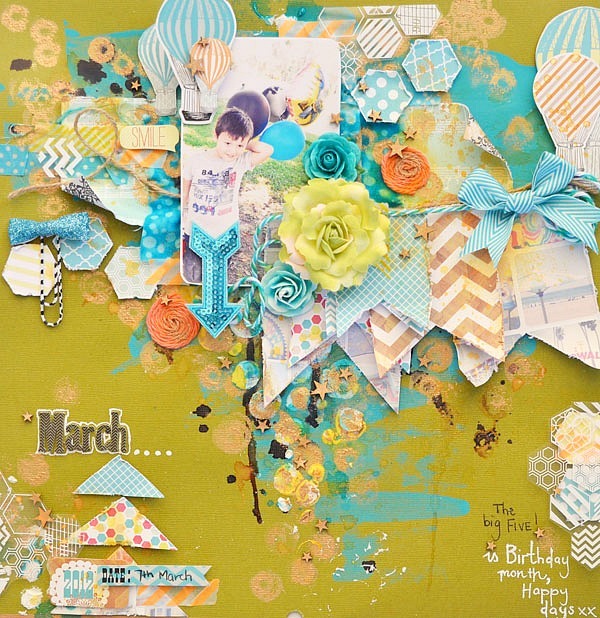 Oh wow.. this is amazing, I love the stars you have there, fabulous layers, totally stunning.. great sketch too... love your layout for March..